So Long New Zealand and Thanks For All the Sheep. Part 2. 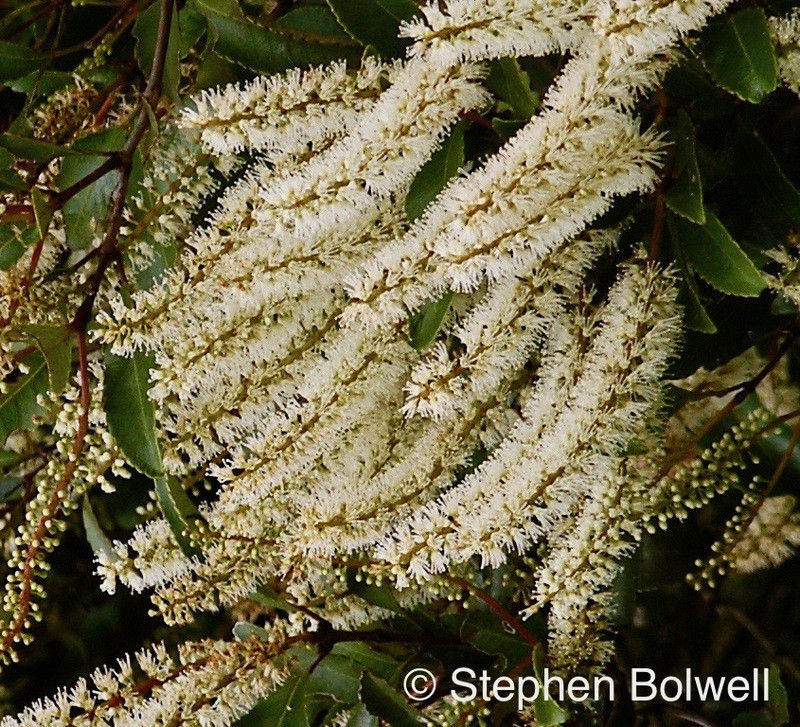 Any European botanist arriving in New Zealand for the first time might just as well be landing on a different planet – so extraordinarily is the plant life on these South Pacific islands. 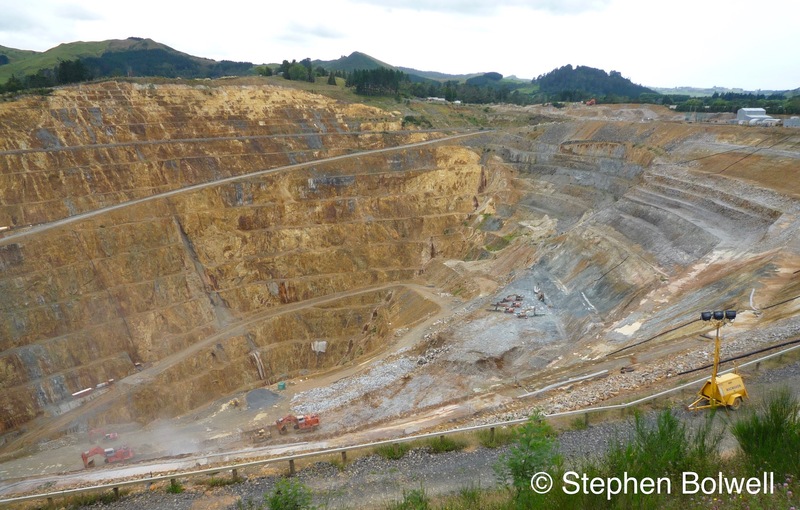 Looking from our mountain to another one – this is Kakepuku. 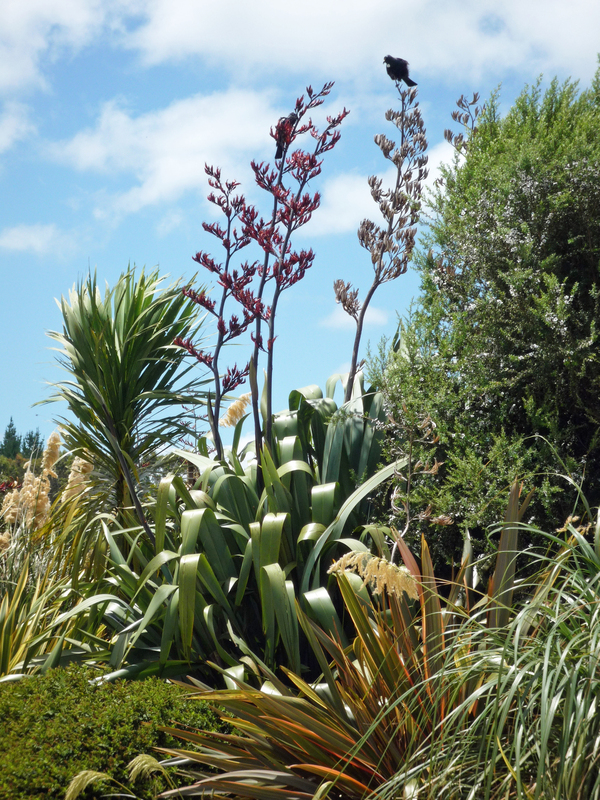 It took four or five years to see any positive results when trying to establish our native New Zealand garden. The one thing that grew easily was flax, and this was encouraging, because I’d seen nectar feeding birds visiting flax flowers elsewhere – so, it wasn’t difficult to join up the dots… soon I was dividing and planting out as many locally grown flax as I could get my hands on. 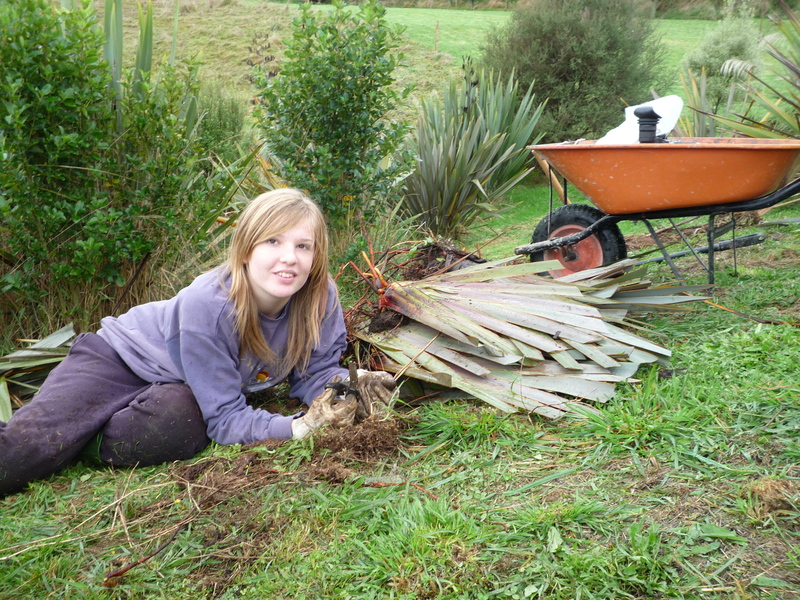 My daughter Alice dividing an old grubbed out flax which might provide 20 starter plants or more. One day I looked out of my office window and noticed the beautiful dusky red flowers of rewarewa blooming in the bush behind the house; and not long after an excitable tui began visiting several times a day to feed upon the nectar, but as soon as the flowers went over, so did the bird, quite literally – it flew over and away without hesitation. This was disappointing, but suddenly it dawned on me that we should be providing a whole range of appropriate flowering plants to attract birds in through spring and summer. Tui feeding on Rewarewa in trees behind the house. 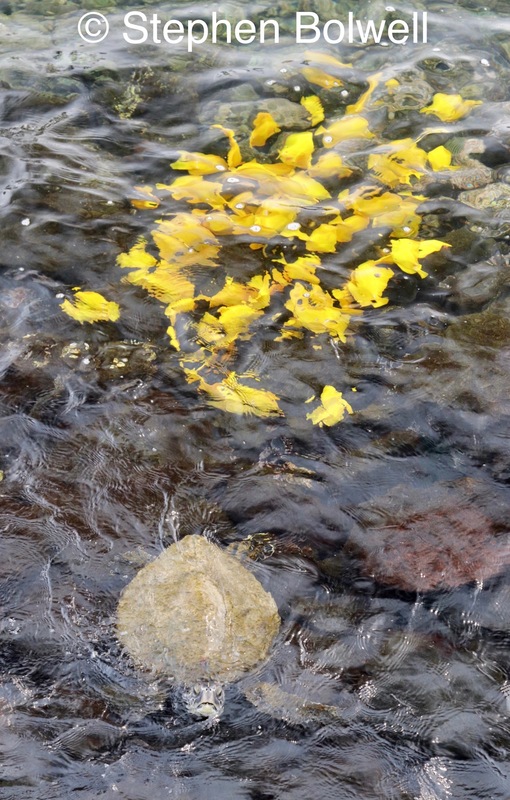 As nectar appeared to be the key, I started playing detective, following tuis to see what they were feeding on. 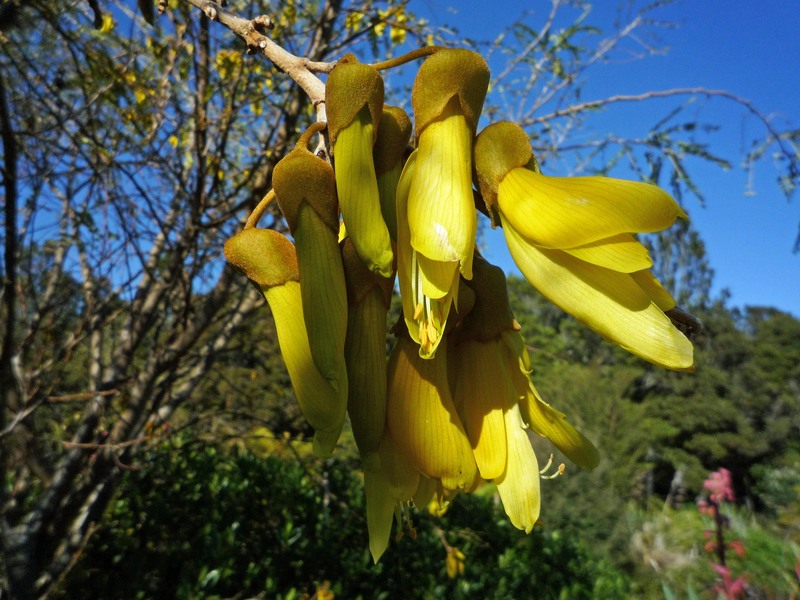 In spring one of the first visits they made was to the beautiful sulphur coloured flowers of kowhai, and there the guilty bird’s faces were soon covered in pollen. Almost everybody in New Zealand must have seen this, but it was a revelation to me. 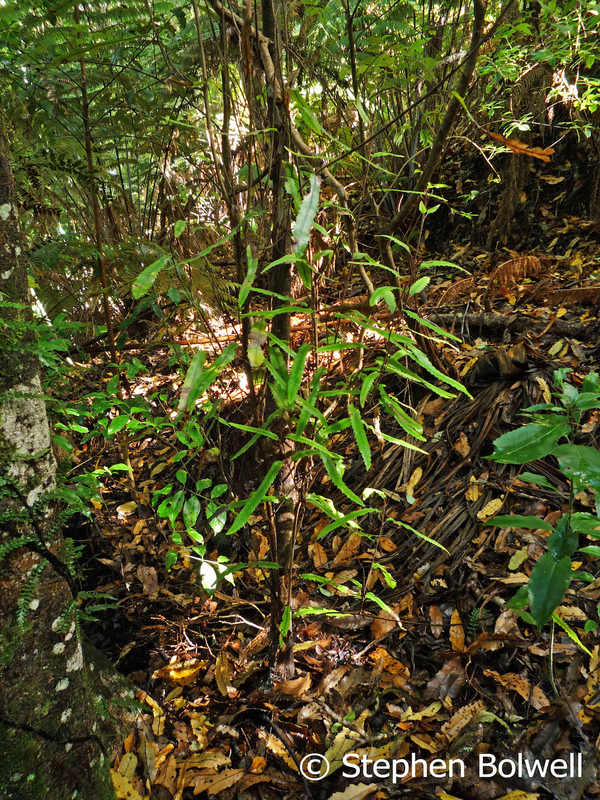 On the day of my discovery, I set about searching for kowhia seedlings, which were easily found growing close by adult trees and were soon potted up and placed in a shade behind the house to establish. Kowhai flowers are perfectly shaped for pollination by the curved beaks of tui and bellbird and once our first flowering kowhai were over, the birds moved quickly on to fresh rewarewa flowers in the trees behind the house. 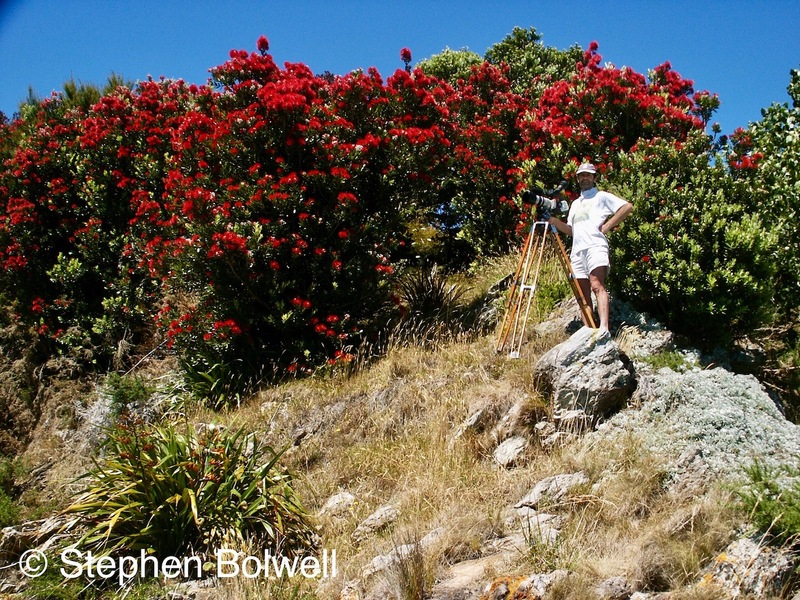 They sought out the colourful blooms just as our first visiting tui had done a few years earlier. I was excited by this minor progress – the nectar timeline availability had been doubled with the planting of a single species. Tui love kowhai flowers and will travel some distance to find them – that is, if native pigeon haven’t already stripped out the buds, which eventually happened to ours, but the trees have to be big enough for the pigeons to bother. 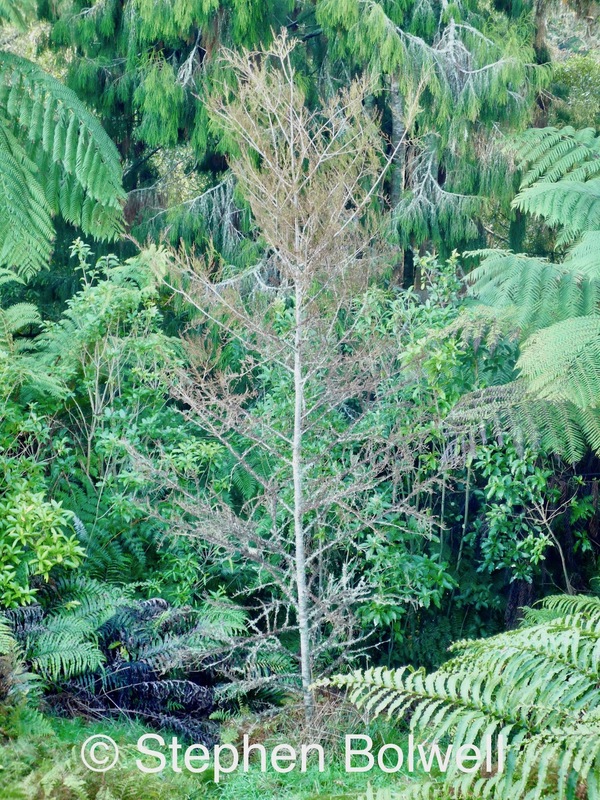 So now there are native pigeons taking their share, the answer is to plant more kowhai. Next in line was the mountain flax, which flowers after rewarewa, and filled a gap until the familiar New Zealand flax started to provide a nectar bonanza in early summer – this progression carried us through the period when tui and bellbird rear their young, and if we could get them to stay and nest we were home and dry – tui feed their young primarily on insects and spiders and there is now no shortage of these. Things were looking up. My flax planting habit now bordered on an obsession, with hundreds of plants going in over just a few days – a hopeful invitation to a future nectar feeding frenzy. I begin planting flax wherever there is space – here on gully banks below the garden where they are interspersed with clumps of native toi toi grass. 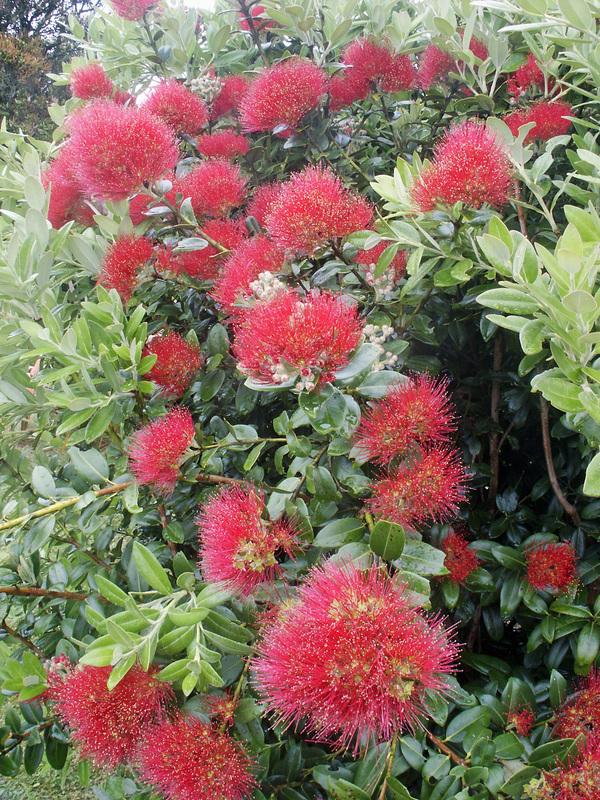 As summer progressed, the nectar feeders (insects as well as the birds), moved onto pohutukawa that had been planted around the garden. Tui more naturally feed upon closely related rata flowers in the bush, but possum stripped them out before our arrival, although now the possum are under control the ratas are growing back. 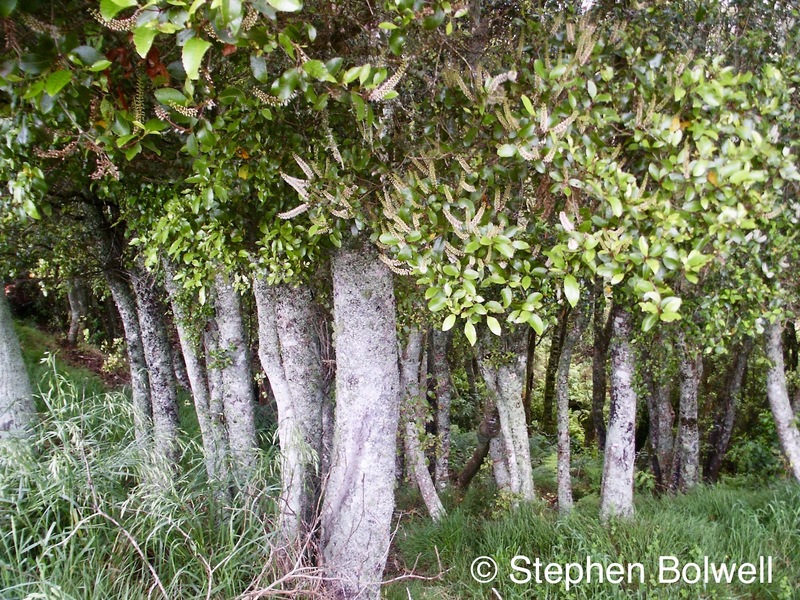 Pohutukawa are susceptible to the frosts we get each winter until they are around a metre high; so these trees don’t grow here naturally and are more usually found in coastal regions where the climate is milder. I would cover our young plants every evening through winter until they were old enough to survive. Pohutukawa flowers brought our nectar feeding season to a close and the birds would then leave in search of other now plentiful foods in late summer. Despite this tui and bellbird became permanent residents for five months or so through spring and summer, and in addition, they started to nest in our bush… Bingo! December 2007. 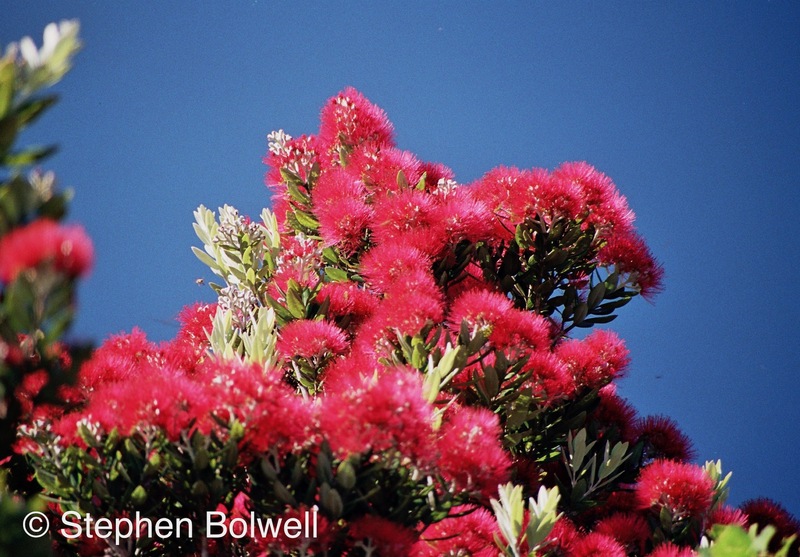 Pohutukawa or ‘New Zealand Christmas tree’ flowers on an establishing tree. Increased nectar availability is a major step forward, but ground cover is also important and I begin to measure success in terms of whether I can see cows in the next door pasture; the flax is beginning to screen them out now, and this is the plant of choice to form corridors along the fence line for birds to move along. During 2007 we began to see more native birds. 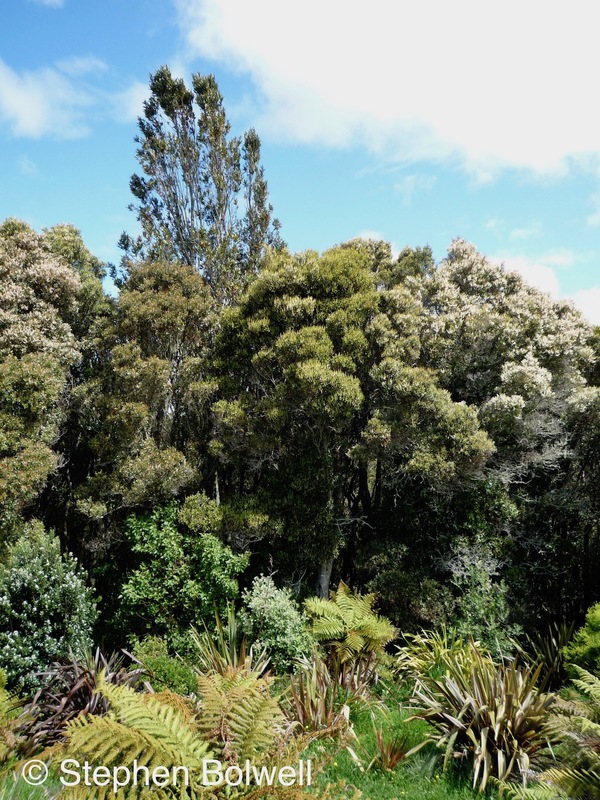 As I had hoped, our garden was developing a symbiotic relationship with the bush, and I wondered if this process might be applied more generally to some other conservation areas – providing the gardens can be prevented from moving into adjoining ecosystems. 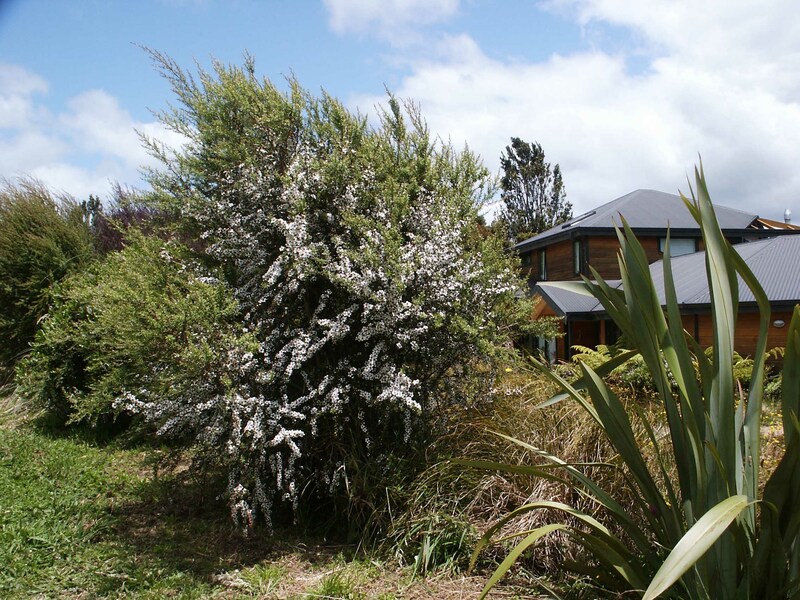 2009: Looking back at the house from the neighbour’s pasture it is apparent that we are getting there – tui have arrived in numbers, bellbirds are also showing up, and both are now nesting in the bush. Mixing wild areas with gardens is usually frowned upon, but if gardens are planted entirely to natives they will provide a concentrated food source for many birds and insects, and do no harm to recovering environments that are still very much out of balance. And there was a lot else to establish on this land besides flax. Manuka had died out altogether due to a disease that hit the local area sometime before we arrived. 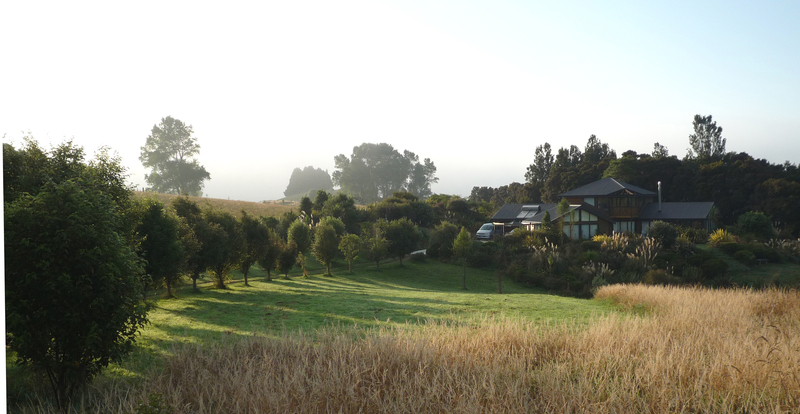 Eventually the manuka were re-established by collecting seedlings from locations where they grew densely, these were potted up to joined the kowhai seedlings behind the house and in a year or two, all were planted out. I learned the hard way that manuka are brittle plants and will snap in a high wind if there is no other growth to shelter them. 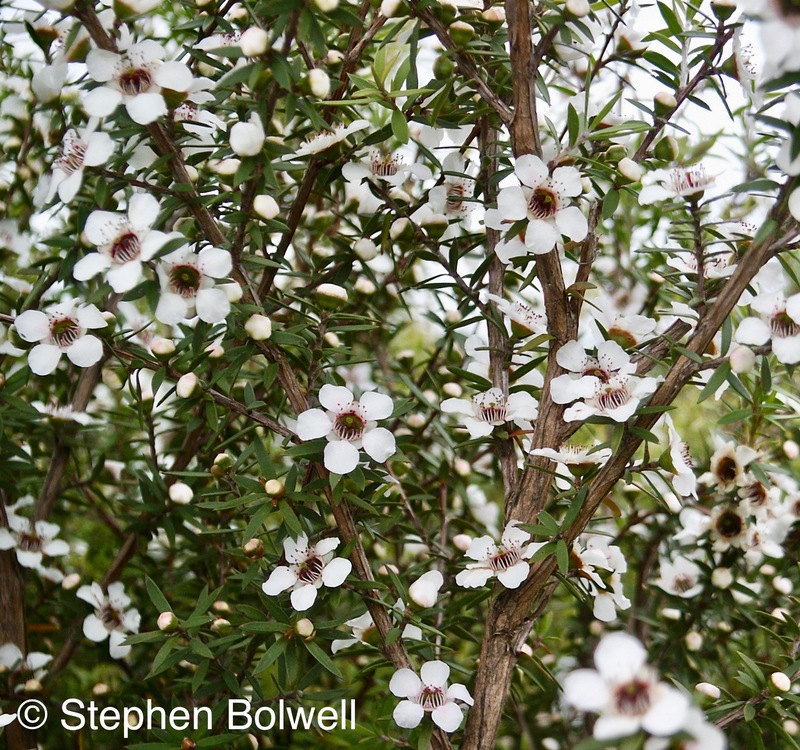 When in flower, manuka trees are covered with masses of beautiful tiny white blooms which attract thousands of native insects – these in turn are eaten by a variety of native birds that get a boost from yet another valuable food source. In addition manuka honey is medicinal and highly valued – we set up a bee hive… but never stole the honey. By 2010 eight acres of land was supporting a considerable number of birds, even bellbirds were moving along the edge of the paddock through corridors of flax, spreading the birds out and reducing competition. The bush occupies half the plot with the rest divided between paddock and garden. It would have been great to get rid of the paddock altogether, but in reality this would have reduced our properties resale value. Conservation is often constrained by practicality and it is better to work within such limitations than make life miserable. 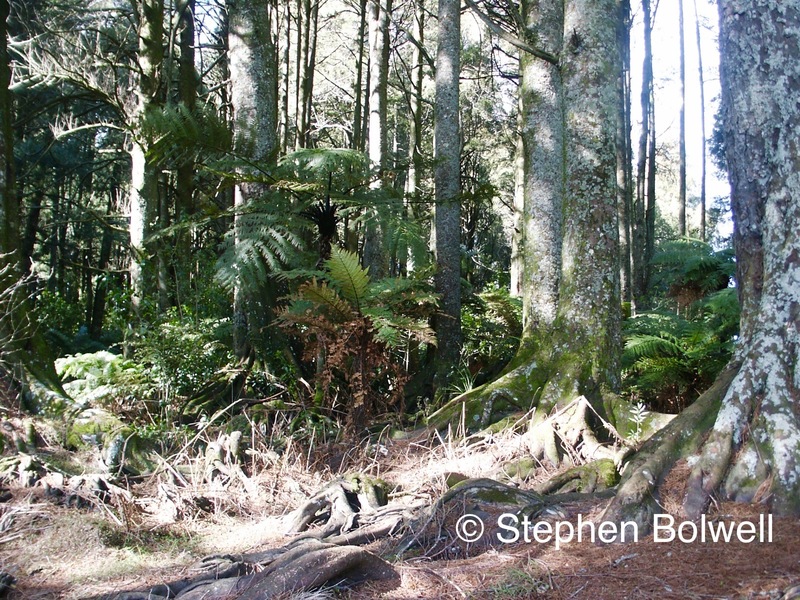 In many parts of New Zealand, the old growth forests have largely gone and there is less natural food available in the young densely growing secondary forests that have replaced them. 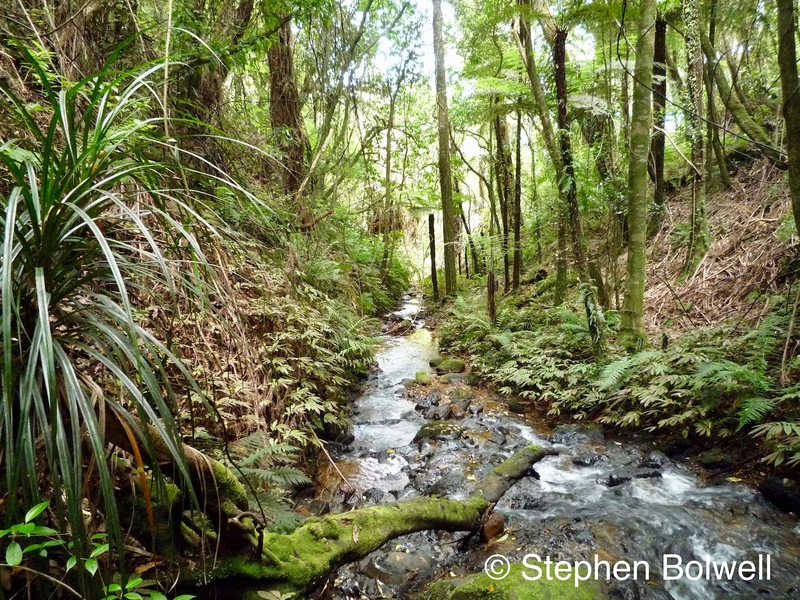 In consequence nature reserves often provide feeding stations to supplement the diet of native birds, but these may also be an invitation to disease, whereas a natural garden has the advantage of providing a super source of food with far less chance of transmitting parasites and pathogens. 2010. From the living room window plant growth prevents a clear view of cows in the neighbouring paddock. Fantastic! I feel much better now that I can no longer see livestock munching grass… but I can still hear them on a calm day. 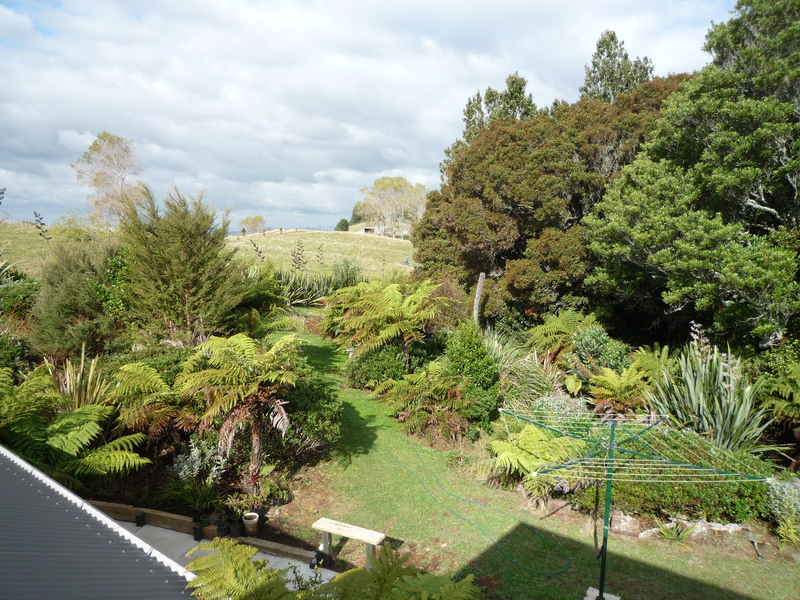 As the garden fills out, the number of bellbird and tui increase in number through spring and summer. Tuis are not uncommon birds – they have declined in some areas but are now making a comeback. A sure sign that conditions suit them is the successful rearing of young – here two recently fledged birds chortle to one another on flowering flax stalks. The young tuis are everywhere now – they are hanging out at the local nectar bars behaving boisterously and are making a lot of noise. In late summer, things will become quieter as the birds move off to feed elsewhere. Young Tuis playing at being territorial. Tuis and bellbirds return in the autumn to feed upon insects, spiders and sap flowing from trees in the bush; they will pick off food mostly at the forest edge where it is warmer, and we see them regularly. As autumn arrives bellbirds feed behind the house. Soon after we arrived, fifty lacebark trees were planted down the drive, they are old enough now to flower and supply food for large numbers of insects. In turn, some insects become food for the birds. 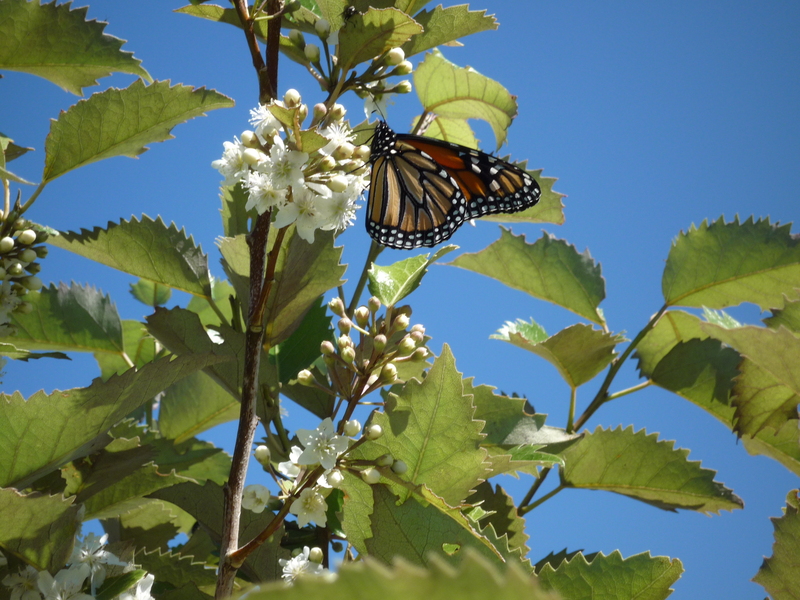 Lacebark flowers are attractive to native butterflies, but I like to pretend that Monarch butterflies should be here, rather than just in North America where they are truely native. Establishing the strangling plant Muehlenbeckia australis behind the house has increased the number of New Zealand copper butterflies that live here; there were very few when we arrived. The adults are now common through January as the females go about laying their eggs on tiny Muehlenbeckia leaves. 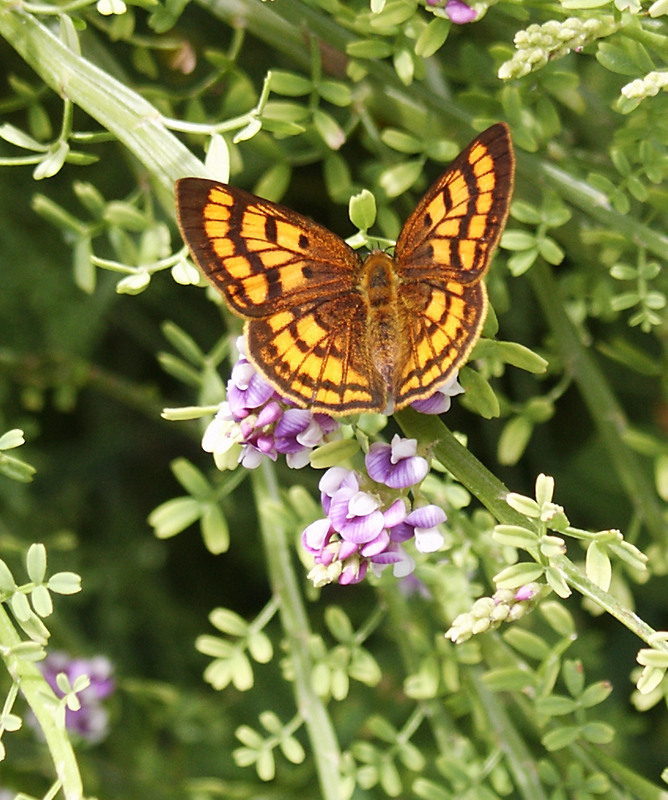 Adult New Zealand copper butterflies favour a native broom behind my studio where they feed and perform territorial behaviour. Hopefully planting more broom plants about the place will increase copper numbers even further. I have tried to seal the bush line with native shrubs and trees and this is already reducing wind damage. 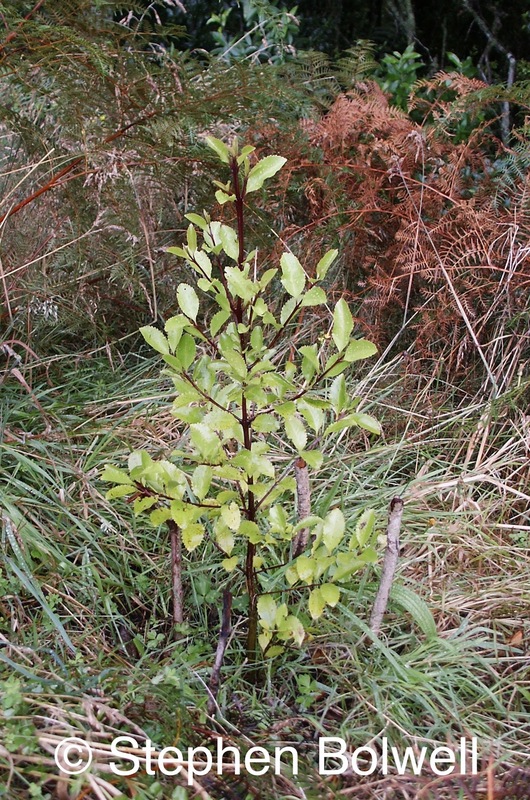 In future this growth will increasingly protect the margins of this little block of bush. 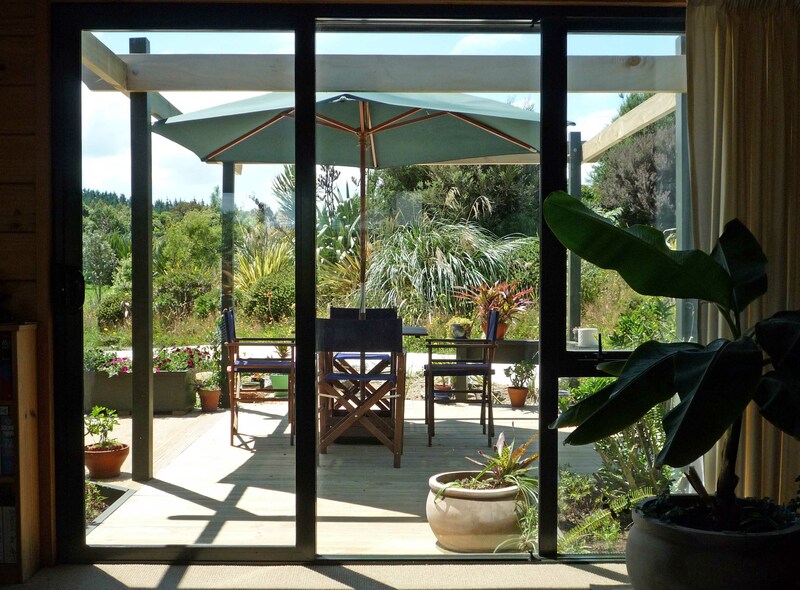 Viewed from my office window at the back of the house, the garden flows effortlessly into the bush and provides protection from wind damage – this can only sensibly be done with non-intrusive natives plants. So that’s the way it ends for us, we are moving on, although I refuse to say ‘to pastures new’. We can’t claim to have saved any species facing extinction, but when rare birds re-establish in the adjoining mountain reserve they will certainly travel down the spur of bush that ends close behind the house. Currently there is a higher density of native birds here than further up the mountain due entirely to a super abundance of food provided by a diverse and concentrated garden planting regime. In the past at the onset of winter it is likely that birds would have migrated down from the mountain to the lush forests and bogs on the plains below, but almost all of this has now been drained and given over to pasture. Tui will venture further afield for food, but this is as far as most native birds will get. Some of the birds we have attracted in were previously uncommon. Tomtits showed up in 2009 which was a first for us. The next on the list might be robins, recently re-introduced to the national reserve (further up the mountain) by a dedicated group of conservationists. Rowdy kaka parrots have been seen on the lower slopes of the mountain and I am confident that they will show up here once the trees mature and begin bearing quantities of fruit. 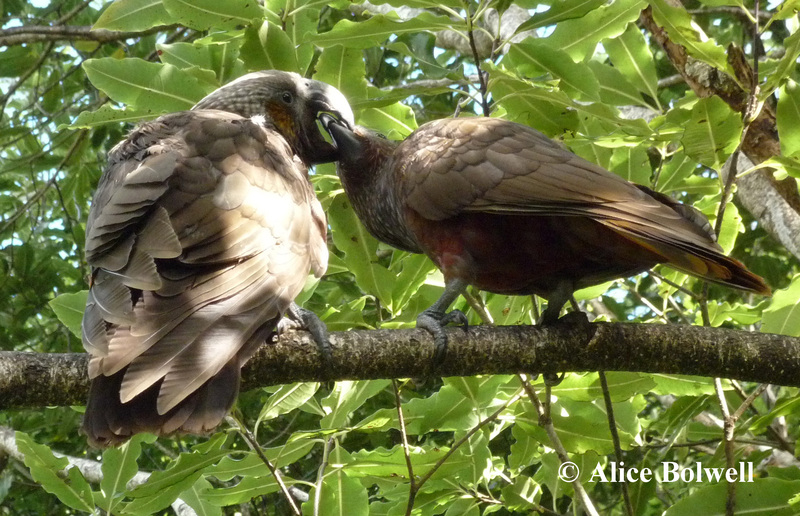 As trees mature some will provide a fruit bonanza for kaka parrots which might one day return. 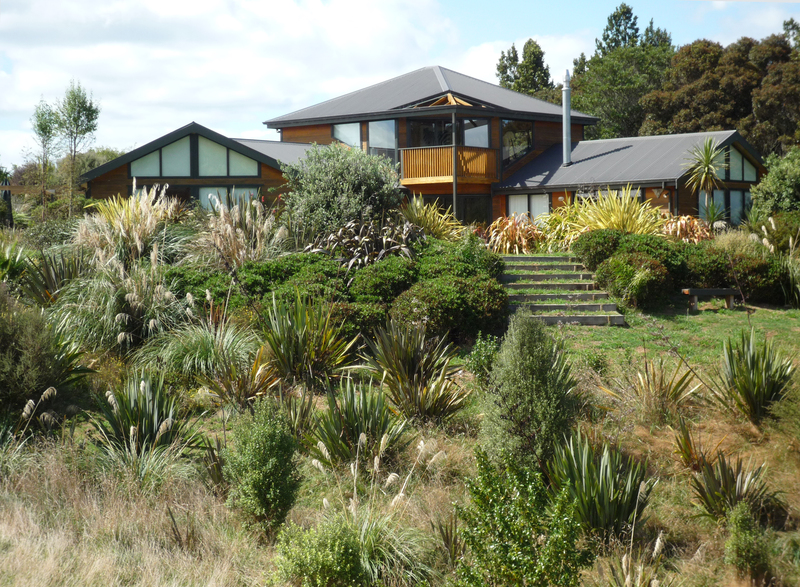 As the bush matures other rare birds (once common here) will also return – no doubt to the delight of future residents living in this carefully sited home. 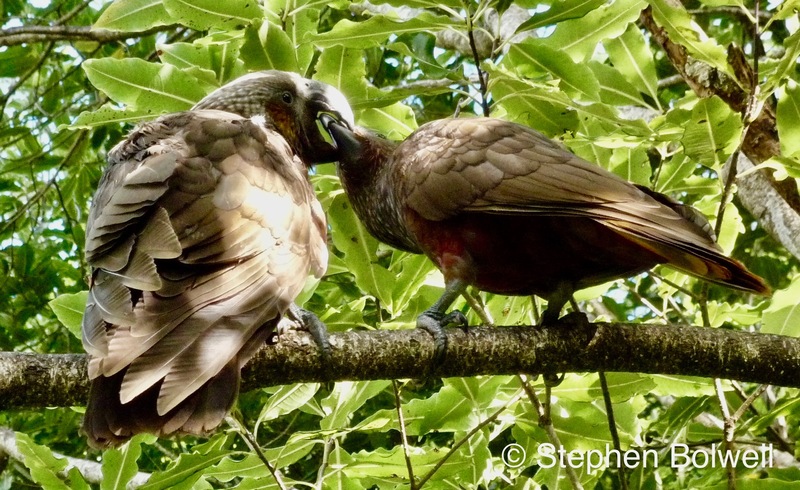 The North Island Kokako was last seen in the area during the 1990s; the good news is that it has recently been re-introduced to the forest reserve – a process that started during 2017. If this is a success, I am quite certain that one day the bird will return and feed on the property. 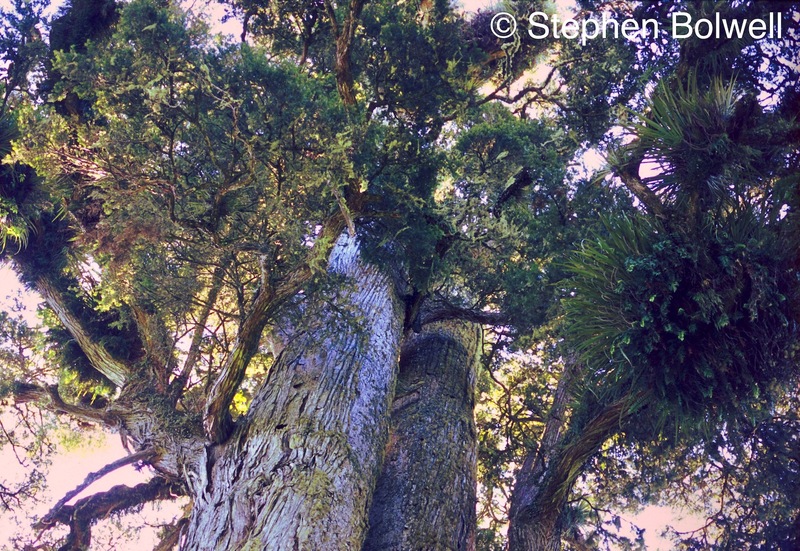 The South Island Kokako which has an orange-red wattle is now thought to be extinct. Sadly this species has not been seen for a number of years, but some remain hopeful that it is hiding out somewhere and will one day be rediscovered. 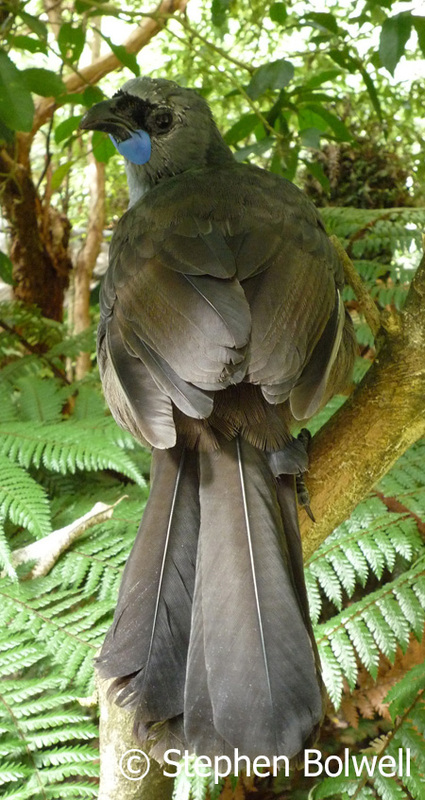 The North Island Kokako has a blue wattle and would make a great addition to the local birdlife. 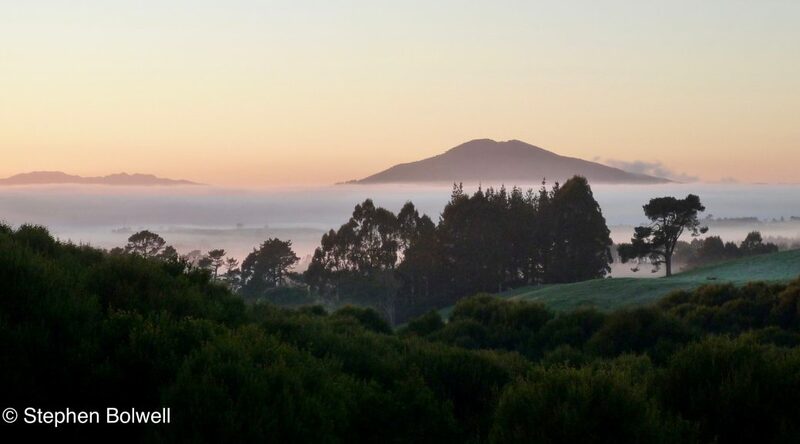 It is already possible to see natural New Zealand treasures from the house. A few weeks before we moved out, I counted (within a few minutes), seven species of native bird moving around the garden while I was sat on the deck – a truly rewarding experience. With a reduction in pests and an increase in food there has clearly been a positive response by visiting and part resident native birds. Our neighbours have also noticed an increase in activity. Bellbirds are now regularly seen where once there were none and although they are less inclined to leave the bush line than are tui, they do now cross an open paddock to feed in our neighbour’s garden, which is a small thing, but an indication of positive change. 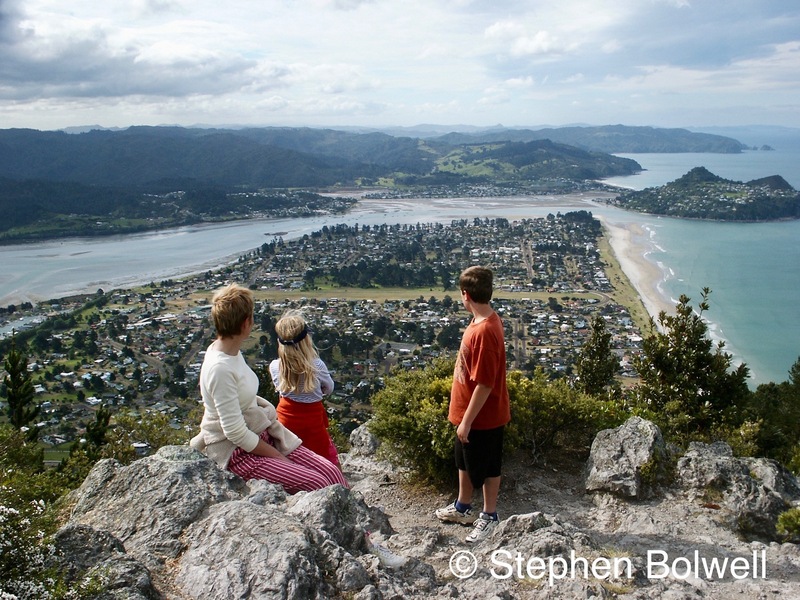 We have left this tiny piece of New Zealand more diverse than we found it; and this is something that almost anybody might do even with a relatively small block of land. It can be easily achieved with a little thought and effort, especially if they don’t keep a cat, and work at effective pest control. This kind of project might be achieved almost anywhere in the world, although it need not necessarily involve nectar feeders, the priority might for example be to establish a greater abundance of seeds and fruits. Certainly planting for the provision of fruit as the bush matures was an important consideration for us. Tui and native pigeon are key birds for seed distribution in the New Zealand bush and it is clear they are driving regeneration here. 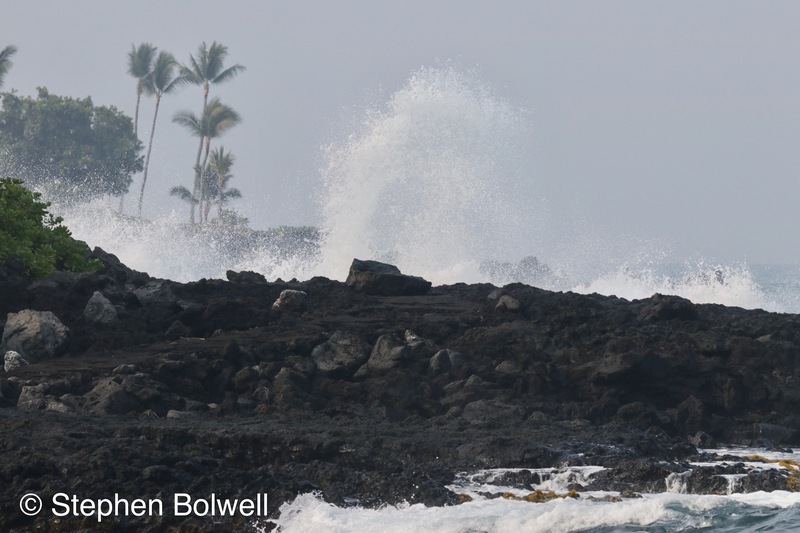 Returning diversity is essential when attempting to conserve ecosystems that have been degraded, and getting the birds and insects back is a necessary but small part of a far bigger picture. Flowers are the key to feeding a great many animals in the New Zealand garden. Our family’s carbon foot print has been covered by planting hundreds of trees and shrubs around this property, while the bush has been left to do its own thing, and now that there is no livestock grazing, the under storey is coming back. 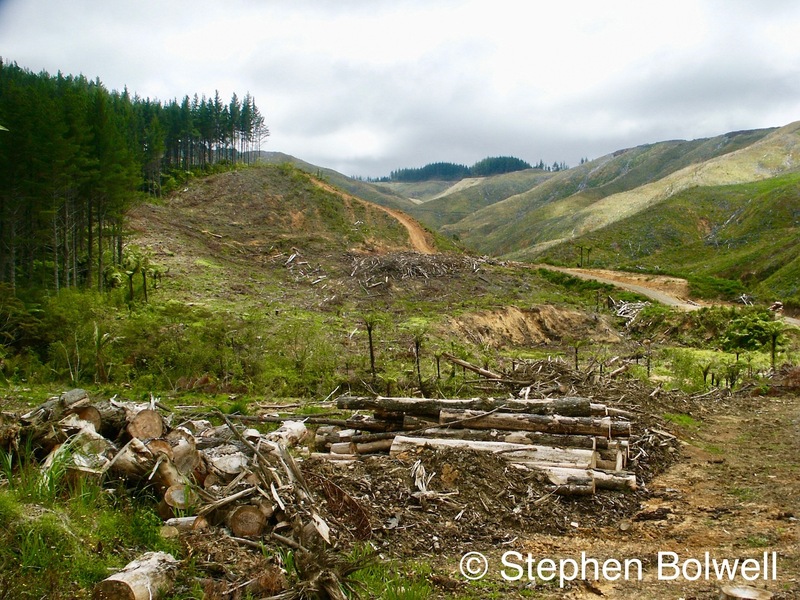 Parts of the bush are now impenetrable and there is extensive lush regeneration. Half the land, which includes all of the bush area and quite a bit that was previously sheep pasture is now protected in perpetuity by a QE2 Covenant, and in theory, nobody will be able to fell trees or graze stock in the protected area again. Each of our actions should be driven by what is realistically achievable, but we must also be hopeful for the future. The house with establishing garden and protected bush behind. Results have not been achieved on this site by using a purists approach, and to a degree there has been a push to move things along. 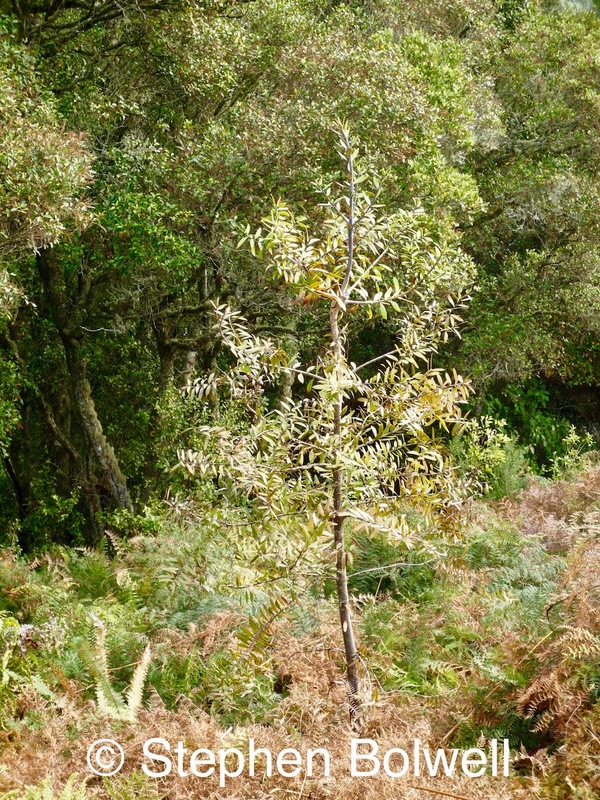 In many conservation areas, the rate of recovery needs to pick up, because for some plants an animals it is a race against time. Whatever the choices we make, it is essential to retain species diversity as our population numbers increase, and natural areas disappear. I can only hope that future residents enjoy whatever achievements they manage in this extraordinary and interesting place, and that they will find time in years to come to ‘take a picture’, and make comparisons that might lead to further improvement, and in some small way help ‘save the planet’. 2002. 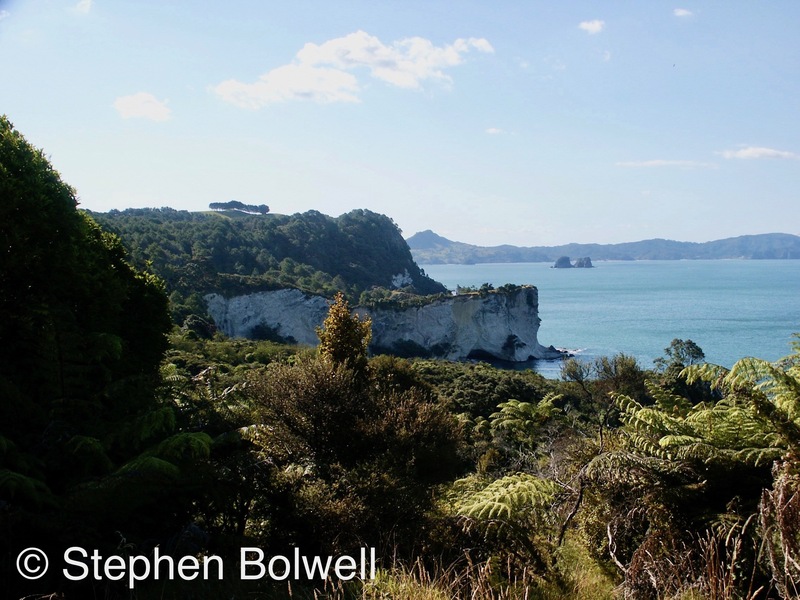 Bird species seen in the bush on our arrival: fantail (Maori:- piwakawaka or tiwakawaka) ; grey warbler (Maori:- riroriro) and morepork owl (Maori:- ruru). Species occasionally seen or passing through: silvereye (Maori :- tauhou), tui and the bellbird (with two Maori names :- korimako and makamako). 2002. Bird species occasionally seen: Welcome Swallow (Maori :- warou) – these increased in number by nesting on the eaves of the house – two or three pairs would regularly rear two to three broods a year 2004 – 2010. 2002 and 2010. Birds species common and nesting: Kingfisher (Maori:- kotare) and Pukeko (the latter a grassland species which is not truly native). 2010: Bird species very common through eight to ten months of the year either in the garden or the bush and also nesting: fantail, grey warbler, silver eye, tui, bellbird and New Zealand pigeon (Kereru). No change: morepork owl – occasionally seen and often heard. Occasional: shining cuckoo (Maori:- pipiwharauroa), tomtit (Maori:- miromiro) and New Zealand Falcon (Maori:- karearea). With thanks to my family and neighbours and especially Alice for helping with the planting in the final stages of our stay. For the second half of ‘A New Zealand Odyssey’ numbers Six to Eleven in approximately 5 minute sequences, please see below. 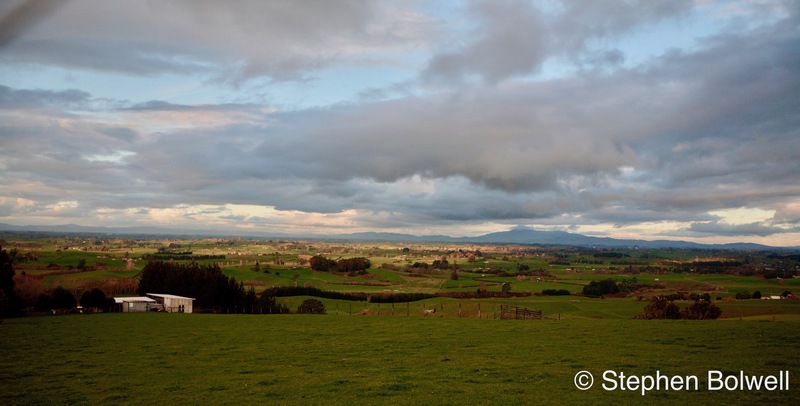 For Numbers One to Five please view ‘So Long New Zealand and Thanks for All the Sheep’. PART 1.